It's not exactly on-message but it's addictive and it's for a good cause. 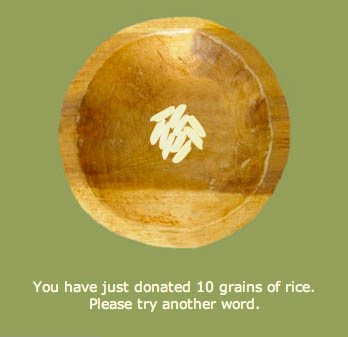 FreeRice is a computer "game" that tests your vocabulary and for every word that you get right, 10 grains of rice are donated through the United Nations to end world hunger. Curious? It's simple: a word pops up with multiple choice answers. If you click the right one then a harder word comes up and the level of difficulty keeps increasing. For every click 10 grains of rice are donated to the United Nations World Food Programme. 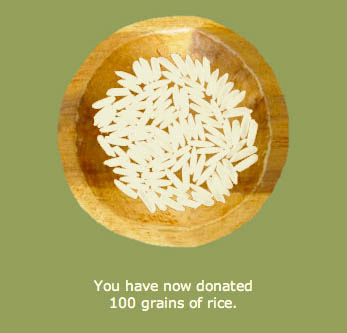 Since October 7, 2007 when it began, 164,650,960 grains of rice have been donated. The site is funded by the advertisers: Macy's, Fujitsu, Timelife, Apple, Office Depot, Reader's Digest and many more whose names pop up as you play the game. The World Food Program is the world’s largest food aid agency, working with over 1,000 other organizations in over 75 countries. I have tried it and have started to help feed the world. Why not take a break and see how much you can help.